The last 2012 Project Life post....today I'm sharing Week 52 which includes Christmas festivities + my New Year's Eve page which wraps up my album. I will admit that I have about a dozen insert pages to complete yet for 2012. 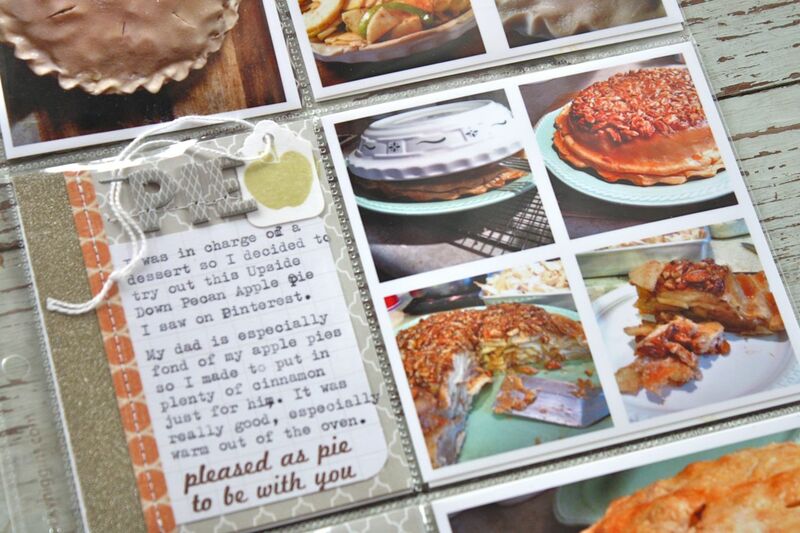 Mainly photographs that will go into smaller sized page protectors. I've made my list and am printing and catching up week by week. So here's Week 52. 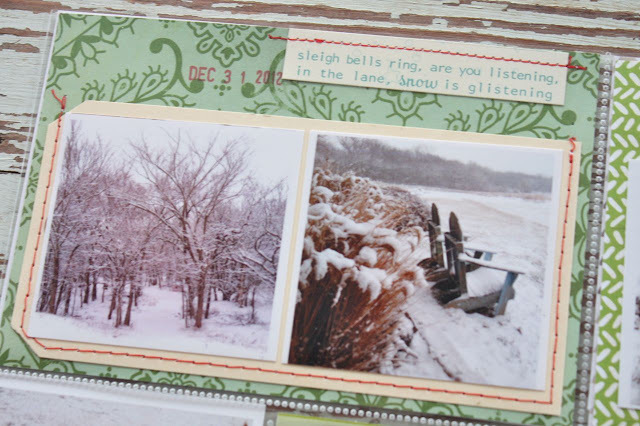 The 2 page spread using lots of my pre-made journaling cards. 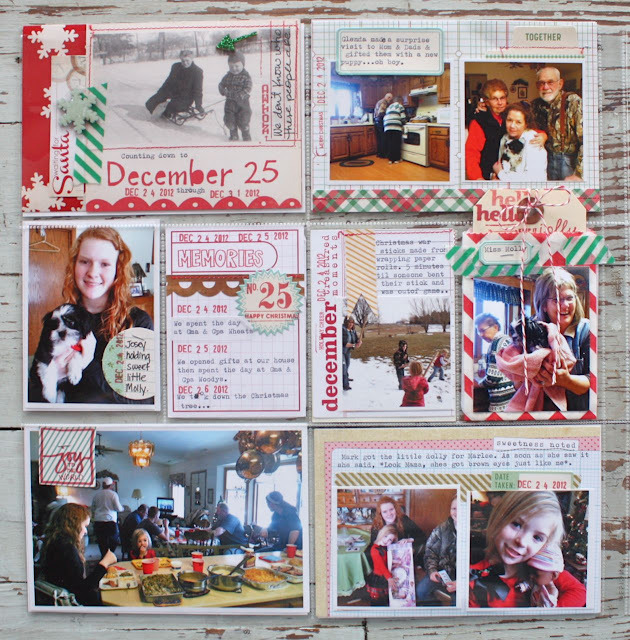 The left page which features a Christmas celebration at my folks. My niece brought her daughter + her fiancee has kids so it was a very lively time. The right page which features more everyday photos from the week. Notice the photo of Jordan below. When I ask for photos now, this is what she gives me. I'll take it and I hope in 10-20 years her kids act the same way. 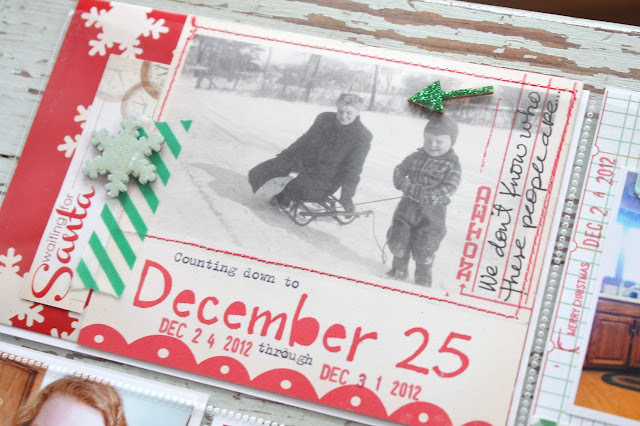 I love this main dated 4 x 6 insert. 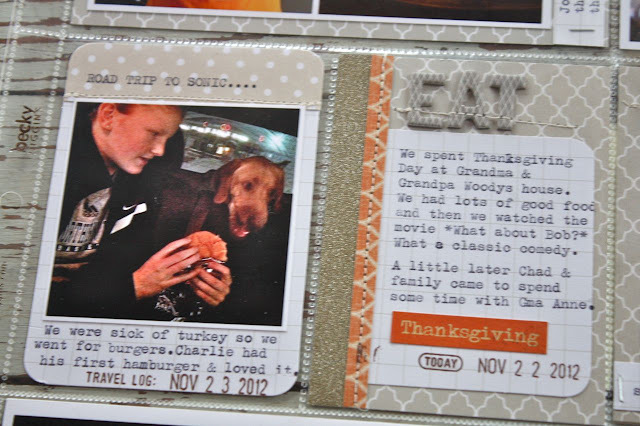 It's a great piece from the October Afternoon papers adorned with some embellished woodcuts and typewriter journaling. 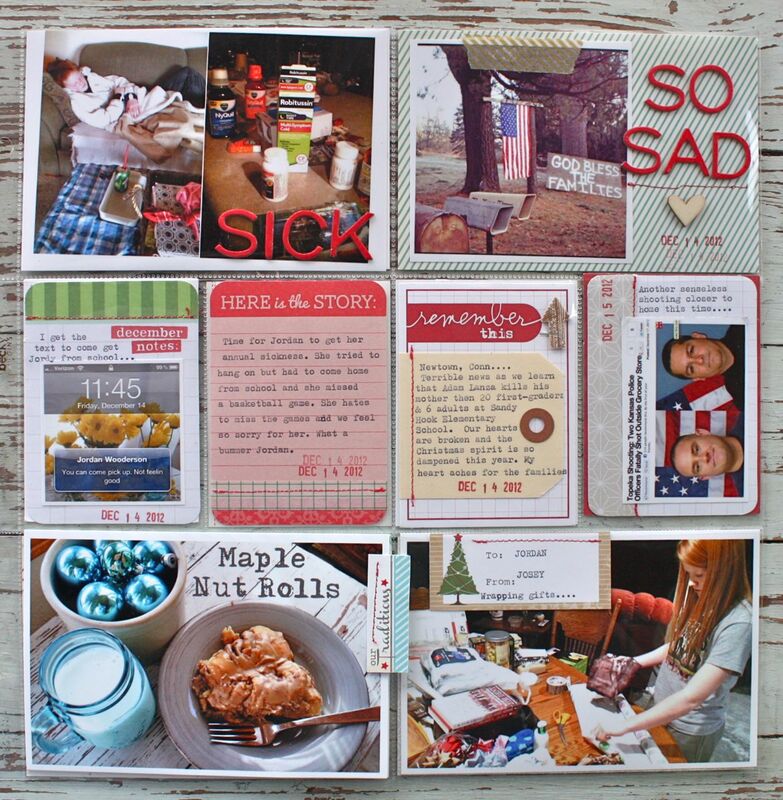 The 4 x 6 inserts. 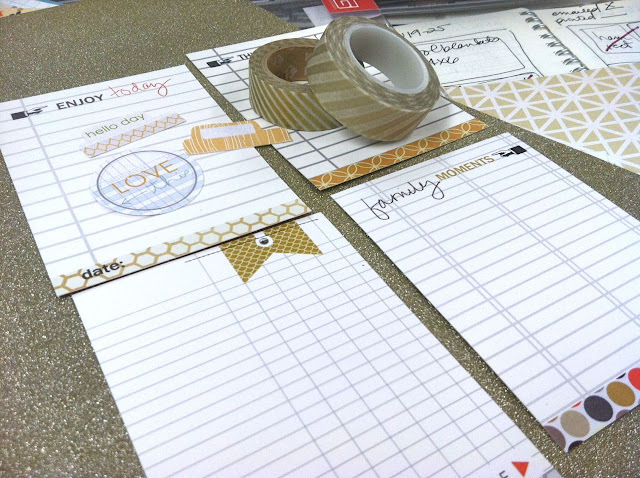 Lots of little labels and tabs from October Afternoon. This is a 4 x 6 card from Elle's Studio. 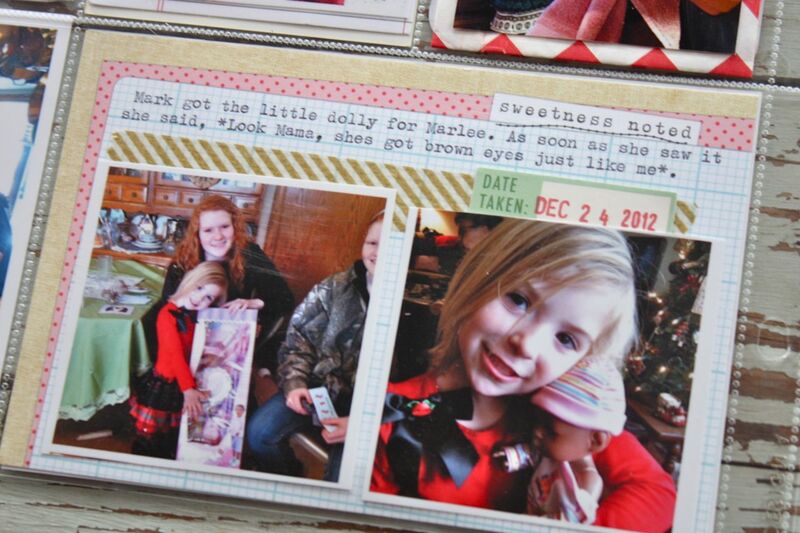 Love how my nice loved her new dolly. Don't let the sweet cheeks fool ya, that girl is a wild child. The day after Christmas. 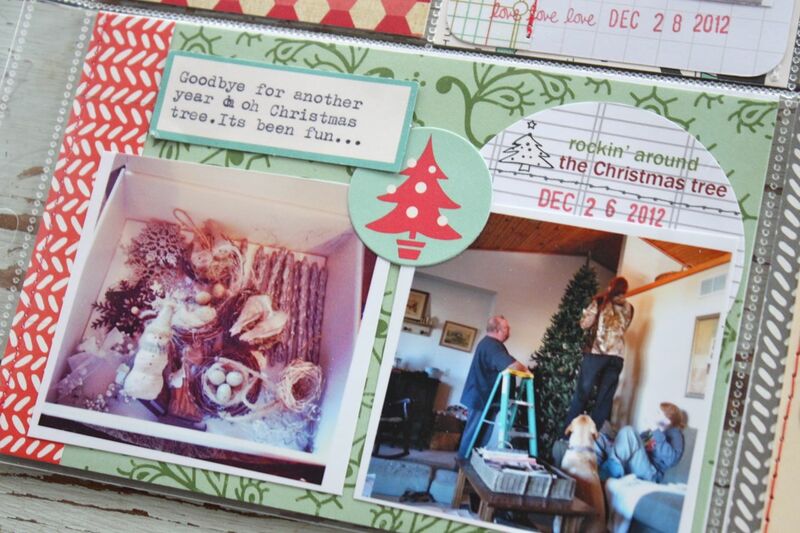 Saying goodbye to the holiday season and the Christmas tree. I took the ornaments off on the 26th because Charlie had mauled enough of them already. More of taking down the tree. I do miss the mesmerizing lights though for a week or so. This photo just melts me. We babysat for Stella, my sister's miniature wiener dog. We were worried that Charlie might kill her by accident so we kept a close eye on these two. They ran and played the entire time. Charlie would get a little rough then Stella would take all of his big toys and run to her teeny bed and hide them. Charlie was so polite though and just nudged into her little bed with big puppy dog eyes. 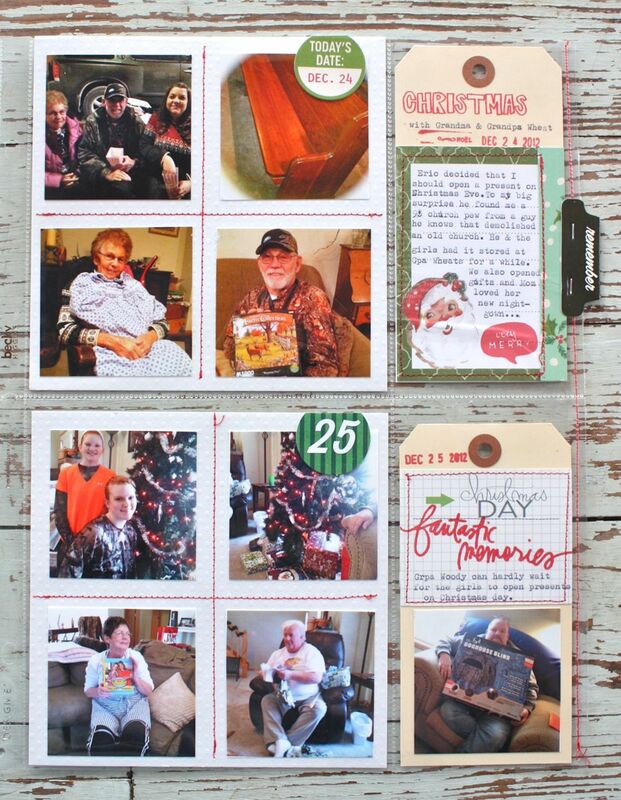 The 3 x 4 inserts. 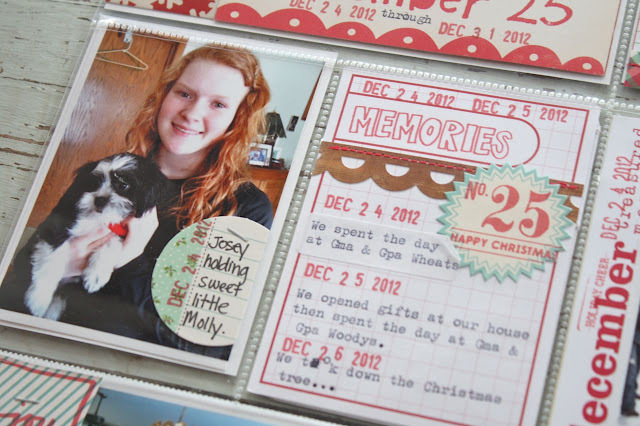 A shot of my parents' new puppy Molly + a week in review card. That fun stamp is from BananaFishStudio. Never a dull moment. Stella escaped while going potty, took a swim in the icy pond, nearly drowned...then my mom's old hair dryer blew fire while trying to dry her off. It was a Christmas miracle this dog survived the day. More like the Griswald's family Christmas at our house. 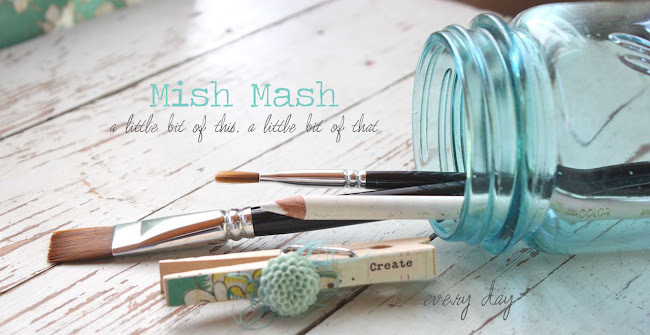 A fun quote that I found since I love the jars so much. Plus a gift from Jordan, another beautiful cutting board. Putting the new stove to good use + a new list of groceries, banking and shopping to be done. I had two inserts for this week. First up is this one that I altered from a bigger page protector that had (4) 6 x 6 slots. 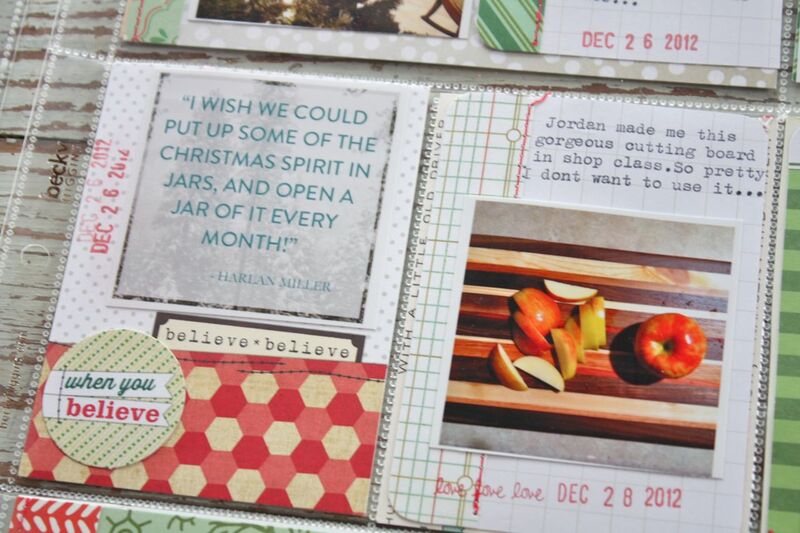 I used the XL tags from my shop as bases for journaling cards and some stamping. 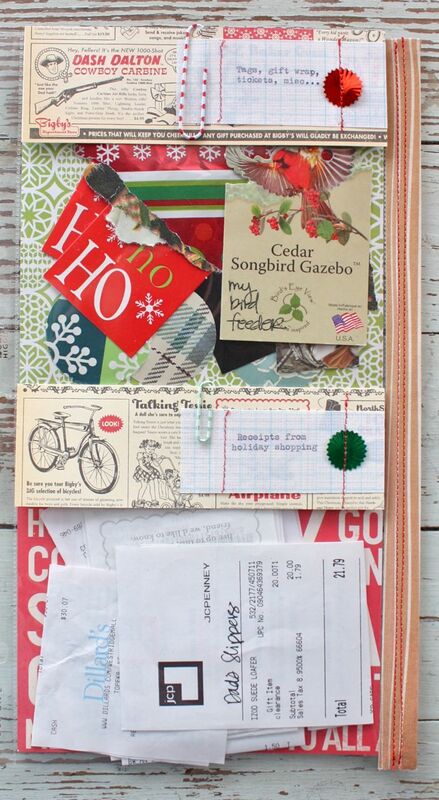 I stitched the right side of the page protector edge so that the tags fit in nicely. For the 6 x 6 inserts I cut cardstock to size and stitched on a grid where small photos could be placed. Loved this look and will probably use it more in 2013. 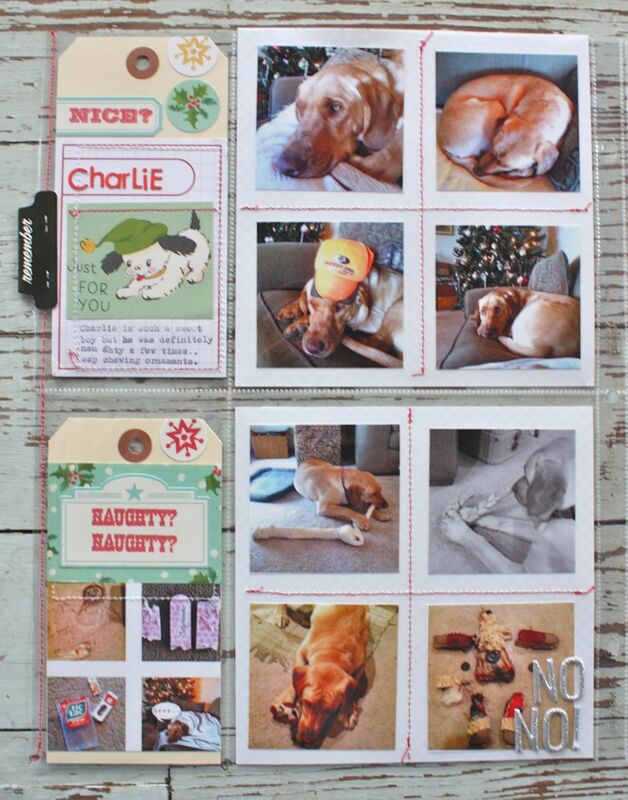 The back side of the insert was dedicated to Charlie. 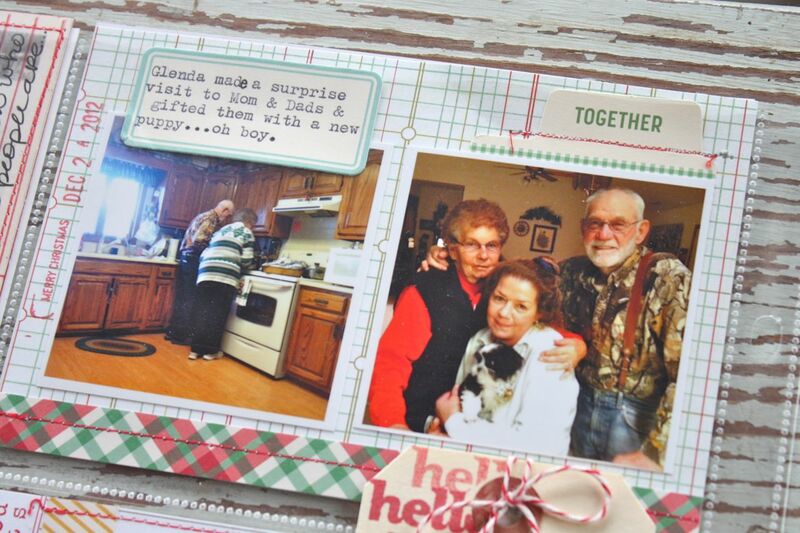 He was sweet but oh so ornery this holiday season. He would ever so slyly take ornaments off the tree and then chew them to death. Plus his big wagging tail broke so many ornaments from him just passing by the tree. This insert was one that I pre-made also, using 2 clear pockets as slots to hold confetti, wood veneer, candy canes and a fun die cut piece from October Afternoon. The back side of the insert. That middle piece is from October Afternoon and was used to make a flipper card. This is the very page of this album and features New Year's Eve. 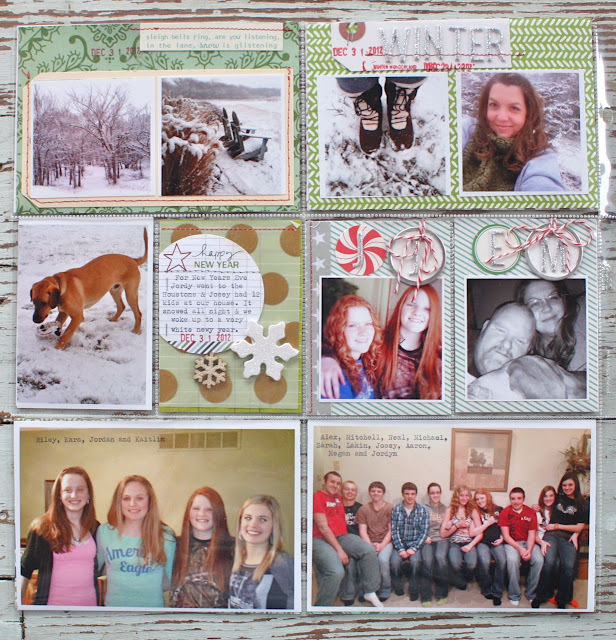 I didn't know how to wrap up the album so I thought a full page of New Year's Eve fun was suitable. The 4 x 6 inserts were ones that I had pre-made. I added another XL tag to this one and added stitching and smaller Instagram phtoos. 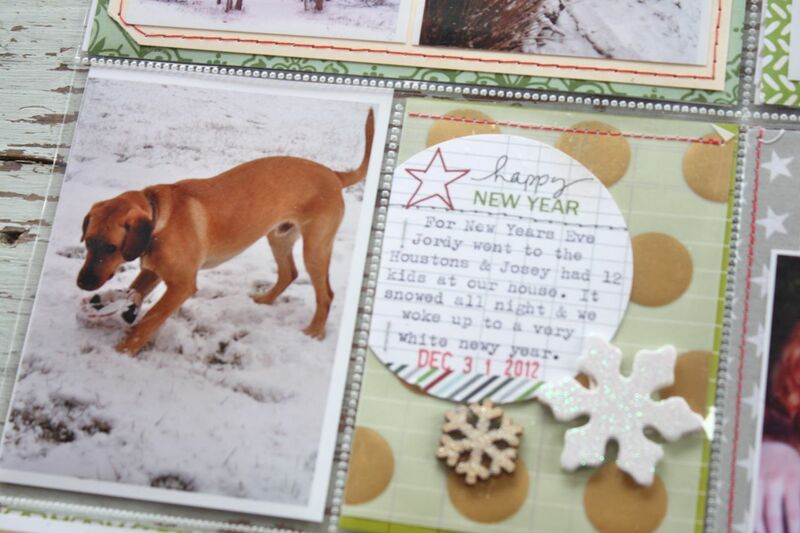 Some 3 x 4 slots featuring Charlie playing in the snow + an embellished card using an Evalicious circle tag + some of my altered wood pieces. 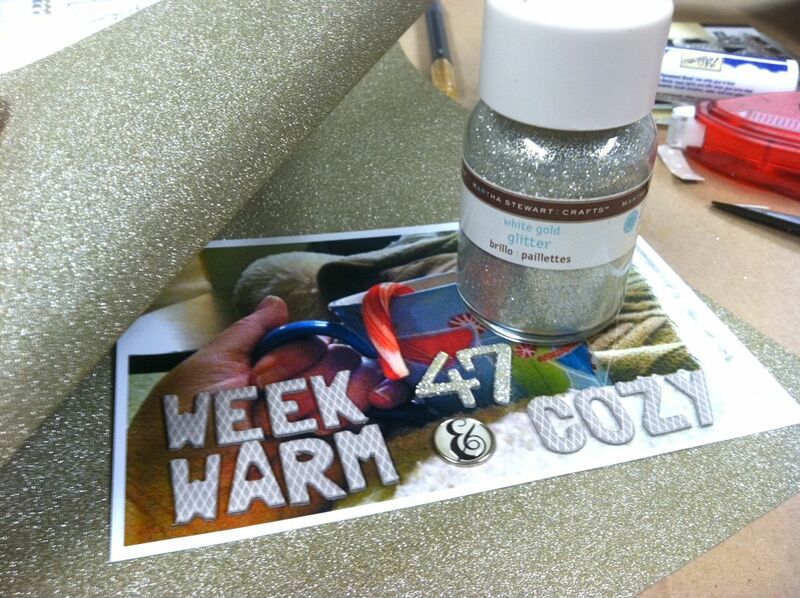 A little silver shine from the fun sticker letters and some Metal Rim Tags. 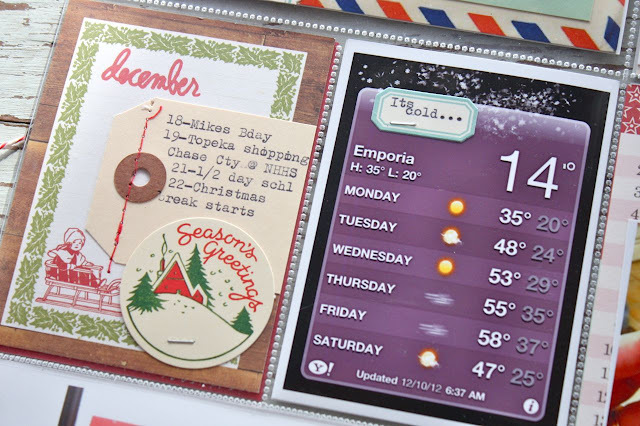 The top portion of the 4 x 6 insert uses a Medium White Parcel Tag, cut in half. Whew, I made it! 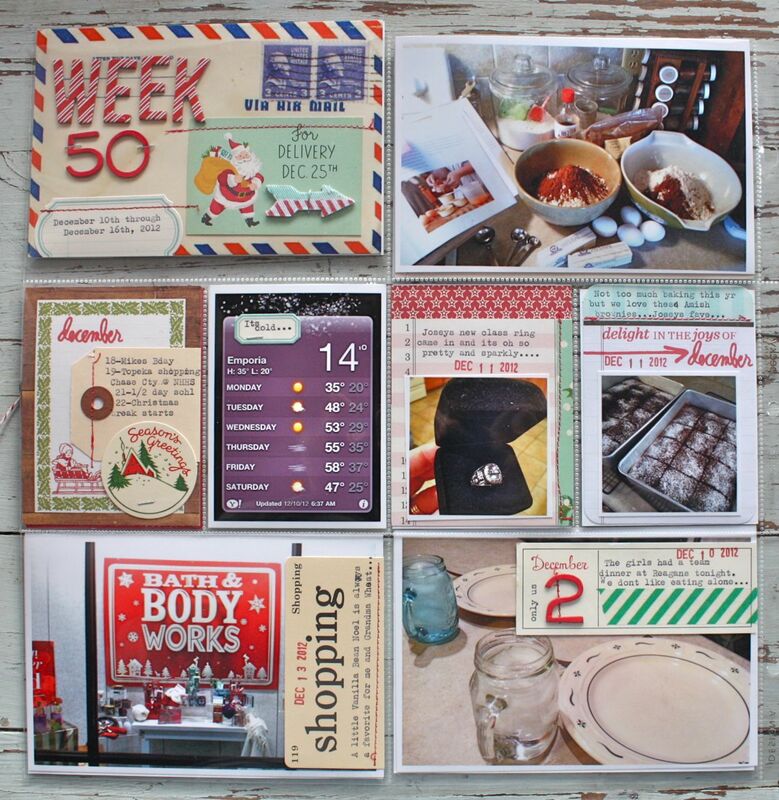 I completed 52 weeks of Project Life for 2012. 365 days of our lives were recorded into 3 albums. 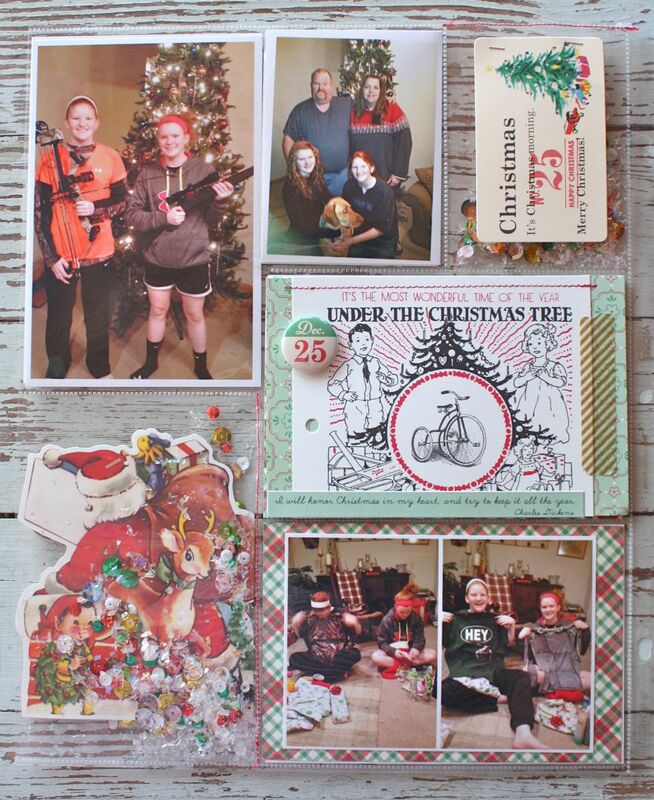 I didn't make it with just 2, but this is all the scrapbooking I did for the year so I think that's pretty darn good. I loved every minute of it and was so glad I took the time to get caught up when I got behind a few months. I have the 3 albums sitting out in our living room right now, for everyone to view. We all take a little time to reminisce and laugh over funny photos and stories. 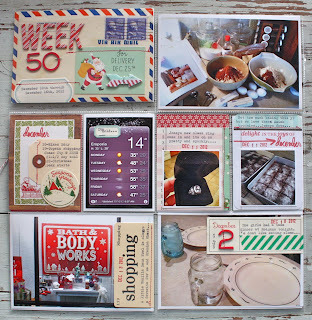 Now I'm on to Project Life 2013 and am caught up to Week 3. I have a few new processes this year and I'm excited to share those with you starting in February. It's gonna be a good year, I hope you'll join me! Today I made a trip to the post office and was shocked at the increase in international shipping, even to Canada which is just over the border. I was charged an extra $20 for miscalculations on 2 orders on what I thought was my normal rates to those countries. Man, I feel sorry for you internationals who do a lot of online ordering. Please know that I want to continue to offer my shop items to my international customers. However at this time, until I figure how to charge you shipping that is a fair rate, I have taken down the international shipping option on my products. Until I get a procedure figured out, please feel free to email me about shipping an order out to you. I can pull the items from my shop and calculate the shipping costs by weight and country. My intention is to never profit from shipping charges. I frequently will send a refund to Pay Pal accounts for overages that are excessive. 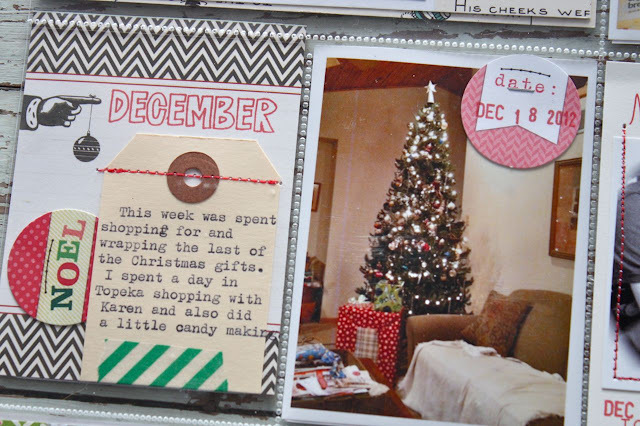 Okie doke, a bunch of you have been waiting for more of my Project December pages where I combined my Project Life with a Daily December. Today I'm sharing Week 50 and Week 51. 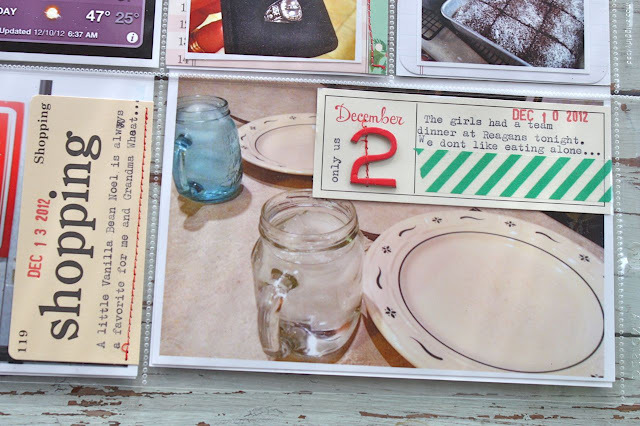 Here we go with Week 50, a 2 page spread with no inserts this week. 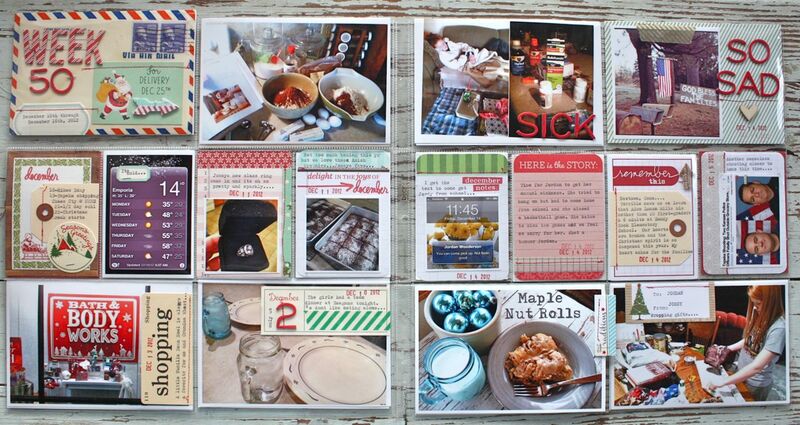 I ended up using a ton of the pre-made 3 x 4 and 4 x 6 journaling cards. 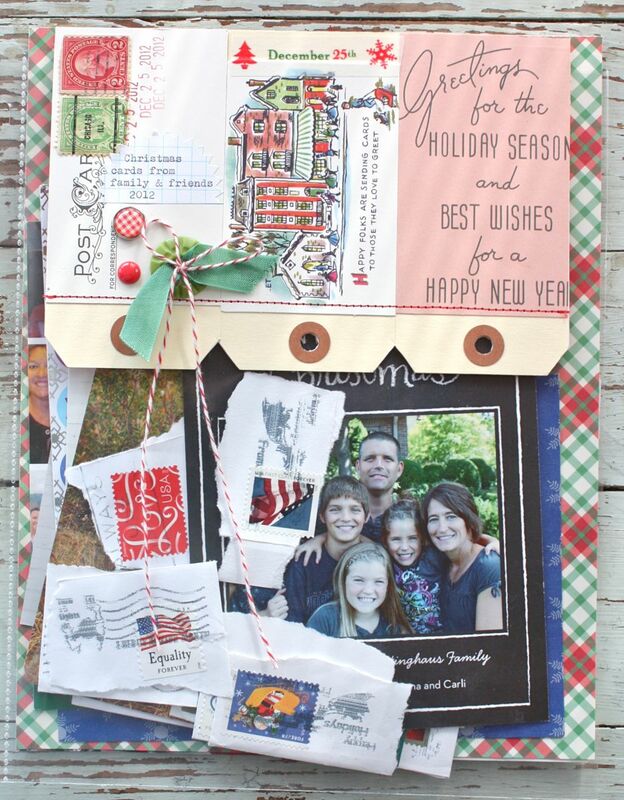 That made it so easy to just pick a card and start embellishing and journaling. A total mix up of happenings and my inserts are jam packed with photos & stories. 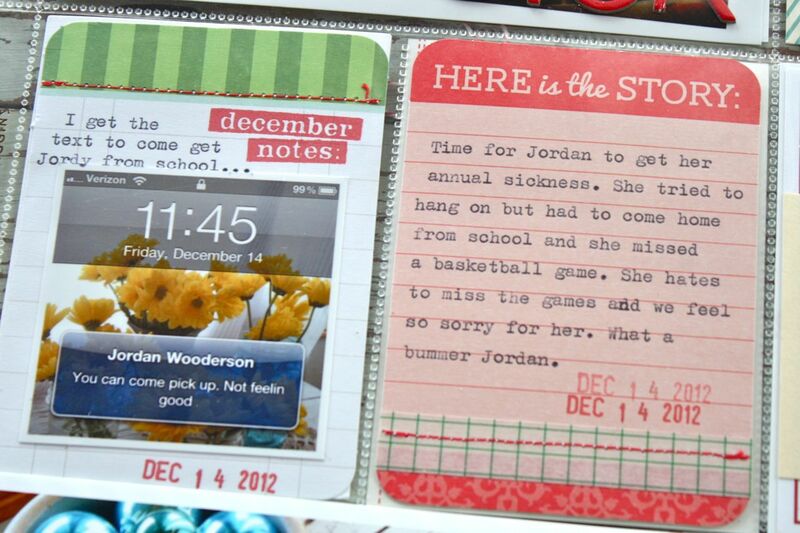 One of my favorite 4 x 6 weekly dated cards. 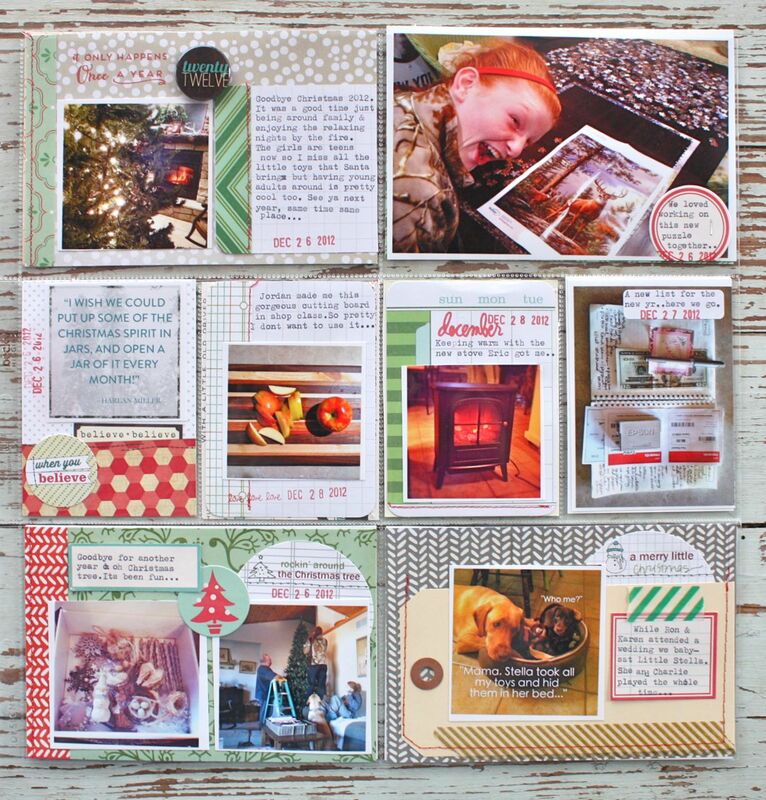 I think the base 4 x 6 piece was from Studio Calico. 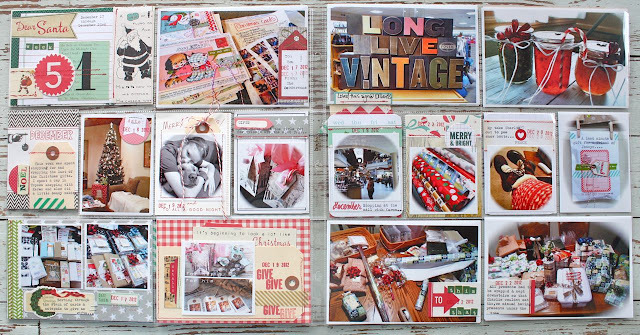 I added an October Afternoon image, stitched label, one of the altered Studio Calico arrows and vintage postage stamps from my stash. 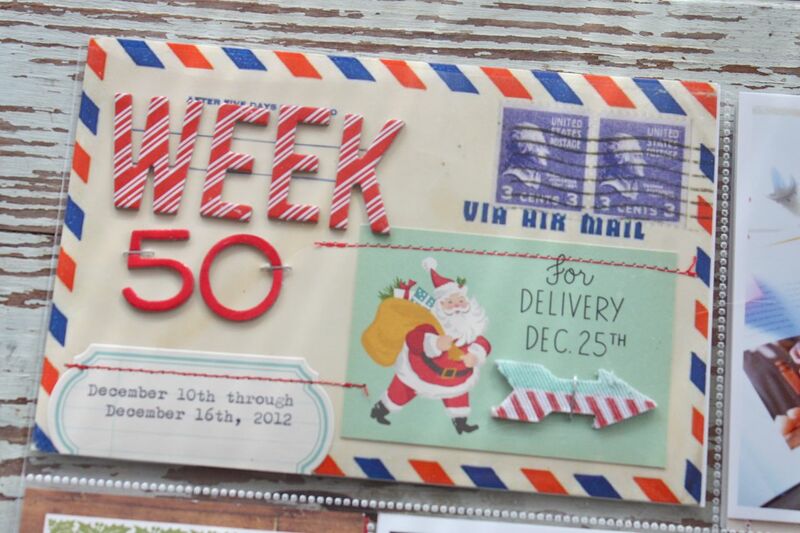 Love the mix and match of the chipboard letters too. 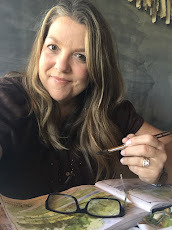 We had dinner alone, just my husband and I on a weeknight while the girls attended a team dinner. We hated it. 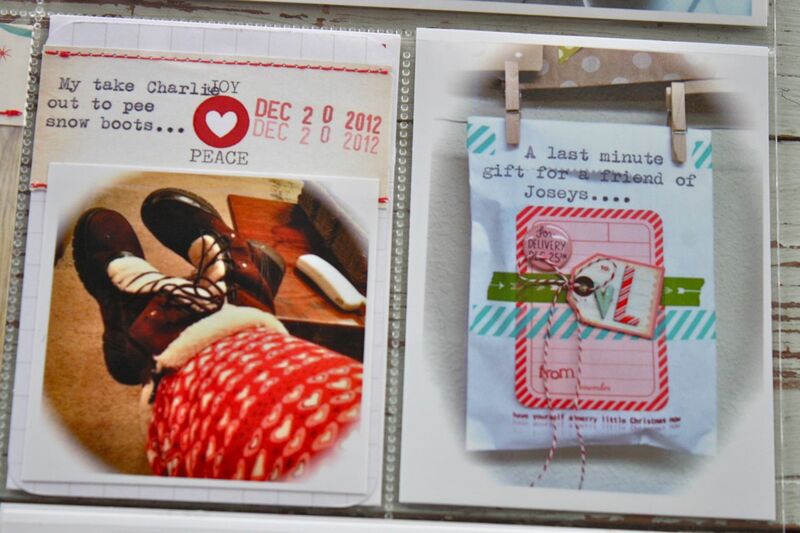 I used pieces from October Afternoon for both of the labels you see below. The shootings at Newtown, Connecticut were so sad. 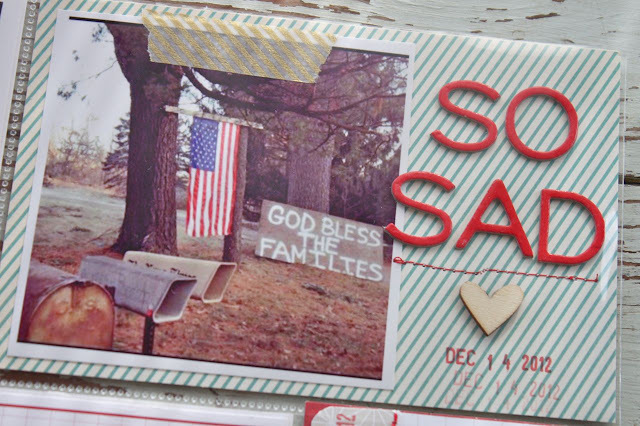 Christmas was just not the same this year as I thought of those poor families constantly. 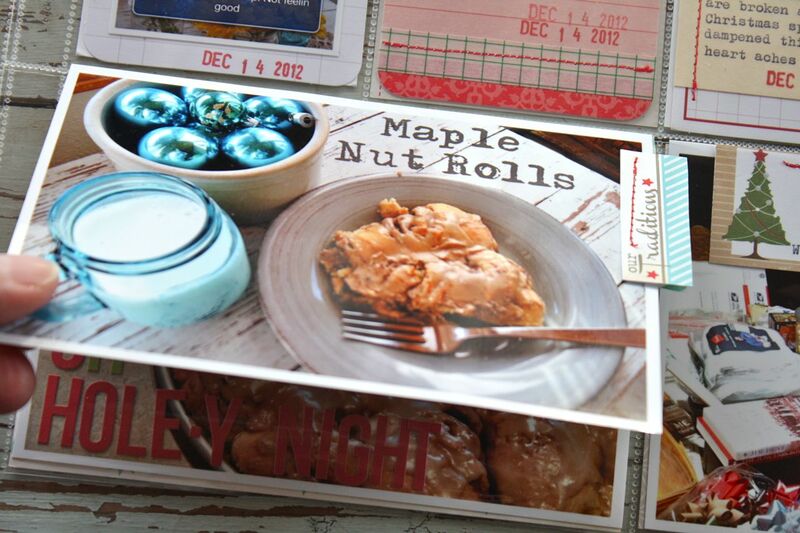 A little 4 x 6 flipper card I created about my mom's Maple Nut Rolls. 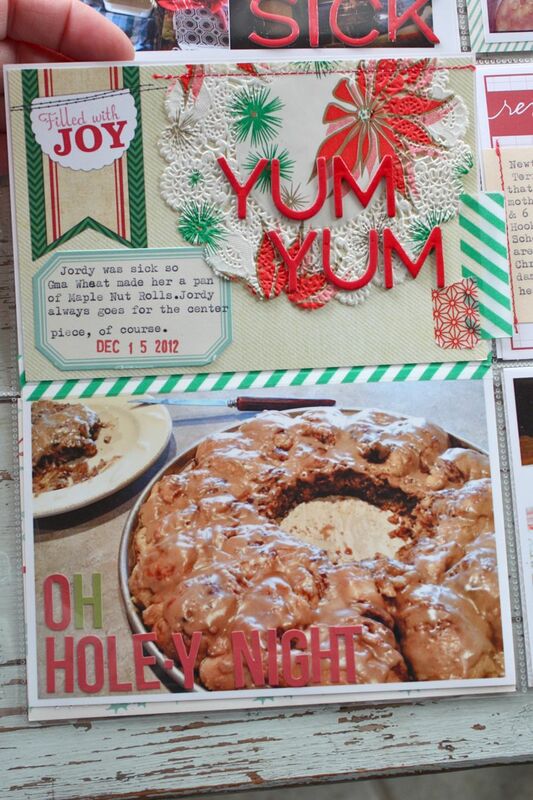 Here's the inside with a play on the phrase Oh Holy Night. 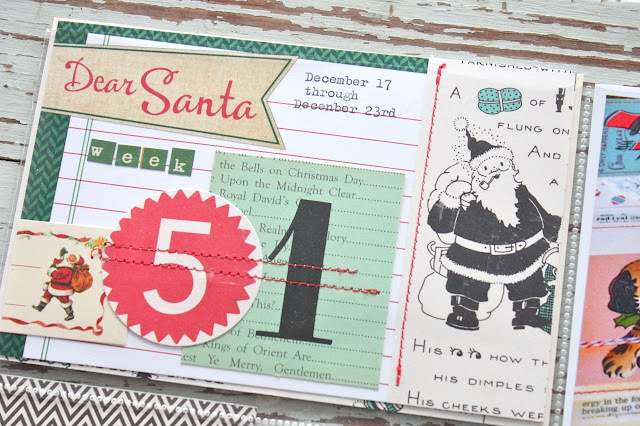 I used one of the lovely vintage Christmas doilies I scored at the antique shop last Fall + an Elle's Studio 4 x 6 card + an October Afternoon label sticker. On to the 3 x 4 inserts. A Week in Review card using OA tag and a tag from my shop + a screen shot of the weather. More pre-made inserts with typewriter journaling and Ali Edwards stamps. Jordy got her usual holiday sickness so that put a damper on the holiday festivities for a few days. Here I used an Ali Edwards journaling card and a tag from my shop to document the Newtown shootings. 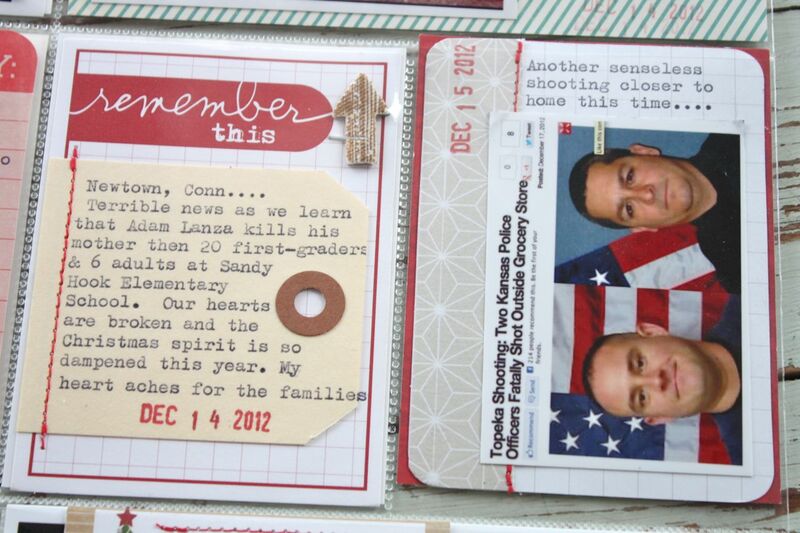 There was also a tragedy in a nearby city where 2 police officers were shot and killed. There is always a part of me that doesn't want to document these type of happenings but they are part of life, part of our story. 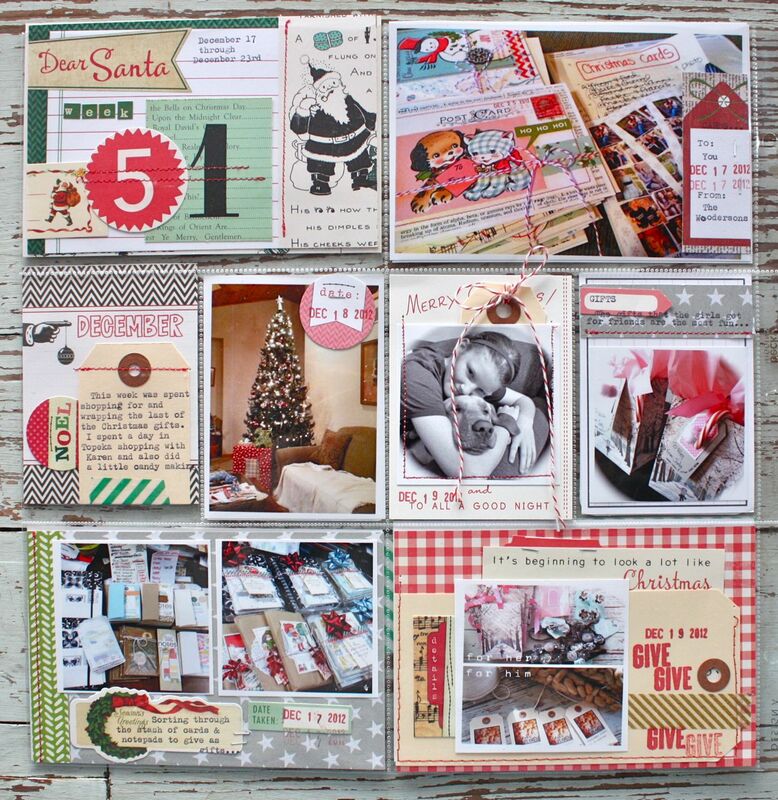 On to Week 51 with several inserts. 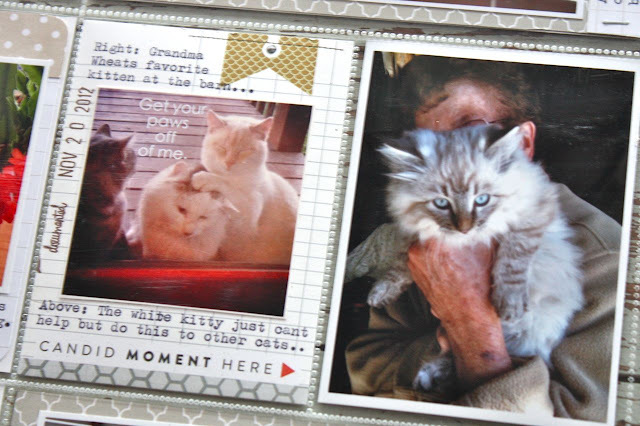 This is the 2 page spread. 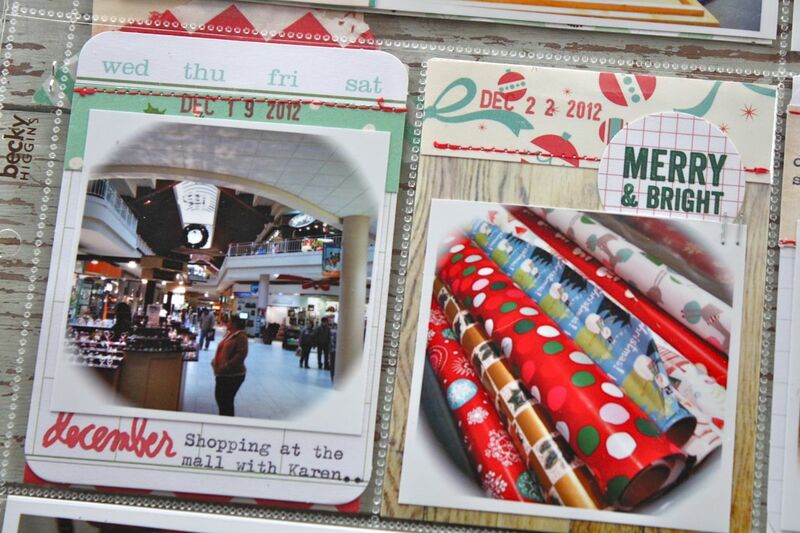 Again, just jam packed with holiday happenings. My mind was a blur when trying to lay this week out. But I got it all in there by golly. I'm so happy to look back on these pages now that a few weeks have passed. I enjoy them so much. 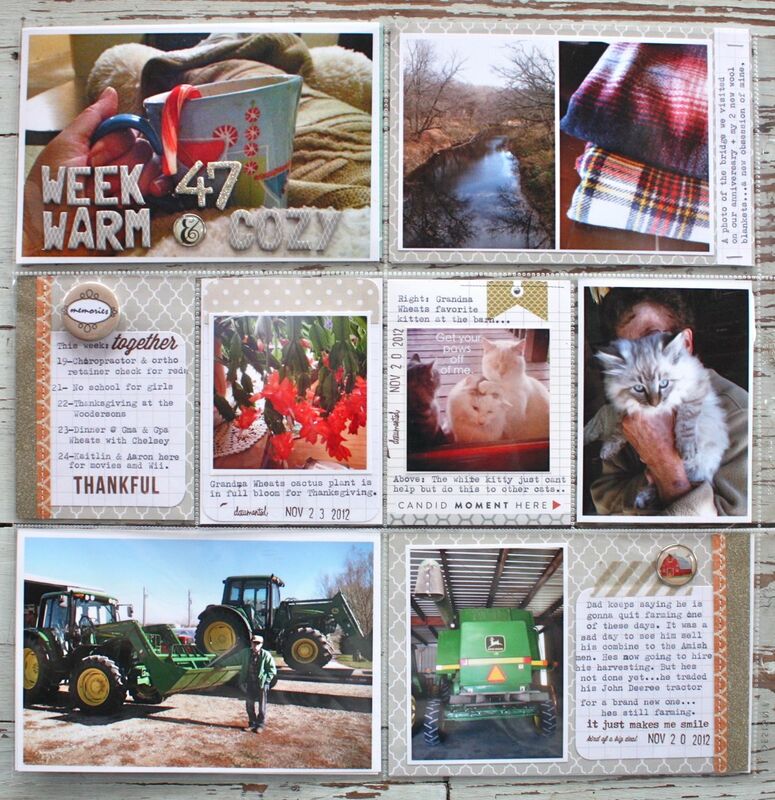 An Elle's Studio 4 x 6 card was used for the base of the main, dated insert. I had previously stitched on an October Afternoon image. 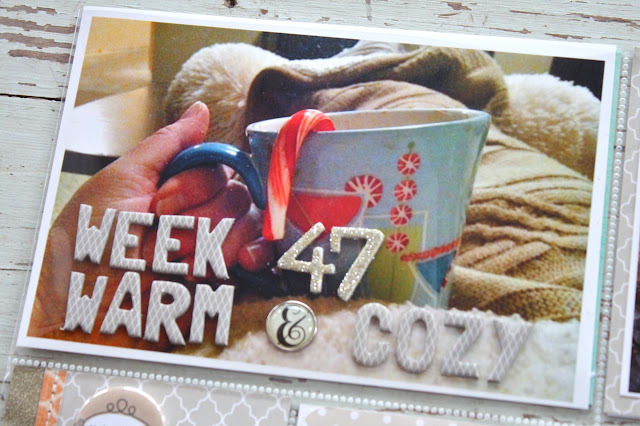 A fun mix up of letters was used for the Week 51. More labels on a 4 x 6 insert card. Here I created a pocket using the largest tags from my shop. 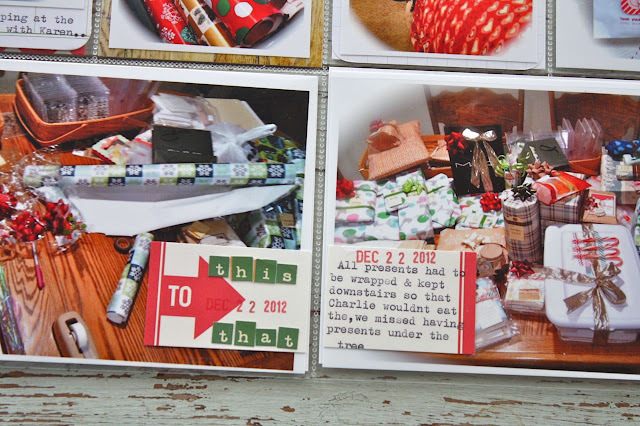 A label that was split in half to use on two photos for a before and after look at gift wrapping. The Week in Review card + a shot of our tree. A favorite 4 x 6 insert of Jordan and Charlie. I stitched a pocket from the photo then added a small manila tag from my shop. October Afternoon papers. On many of this week's photos I used the white matte effect. It softened out the images and kind of made a snow effect. Shopping at the mall with my sister and the stash of wrapping paper. Does this stuff ever die? I think I still have some Bratz paper in there somewhere. The insert that I created ahead of time to hold Christmas cards. 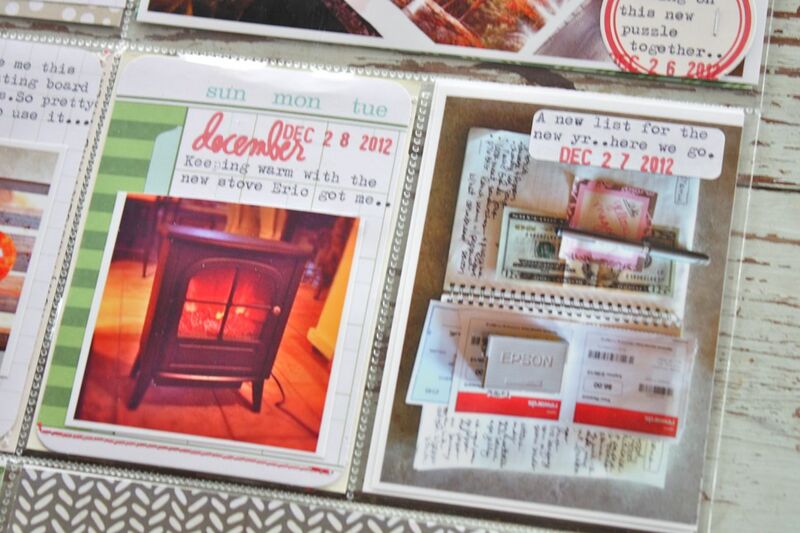 I also like to tear off the stamps and postmarks from the envelopes. This was a huge space taker upper. I'm not sure I'll do this type of insert again. 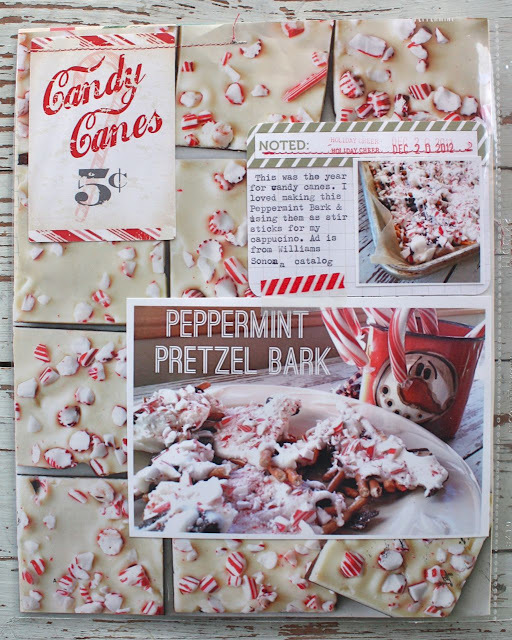 A traditional page of sorts using a Williams Sonoma peppermint bard ad for the page page. Peppermint was the flavor of the day...all season long. 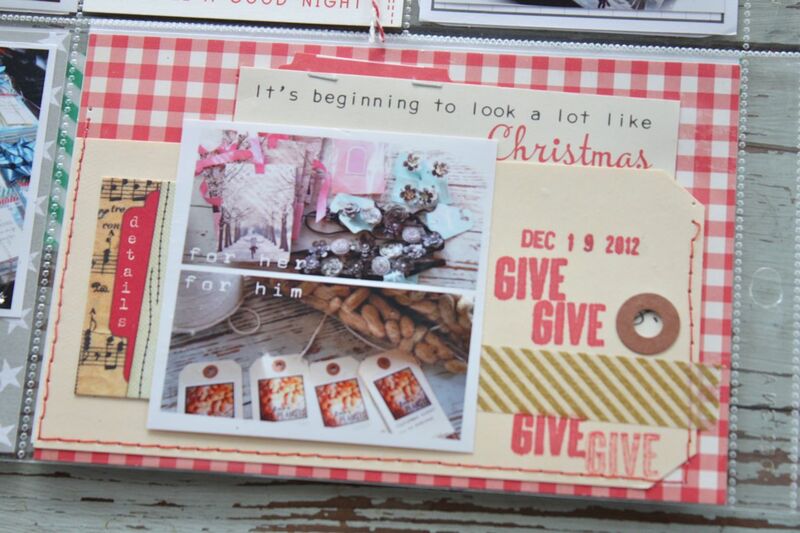 Another 6 x 12 insert that I created early on to hold tags, tickets, receipts and such. Again, it was rather bulky so I may not do this again next year. 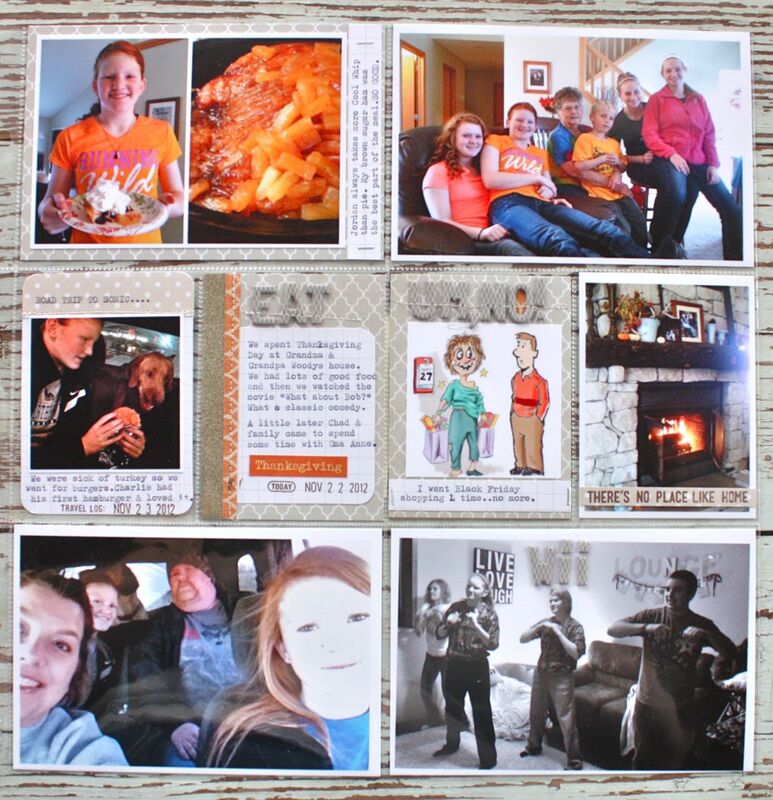 The back side features a large 6 x 6 square photo and a collage of other photos. A snow day, even though we only got a slight dusting. We'll take it! Okay, 2 more weeks down. I'll share Week 52 which is all about Christmas week + a New Year's Eve page. 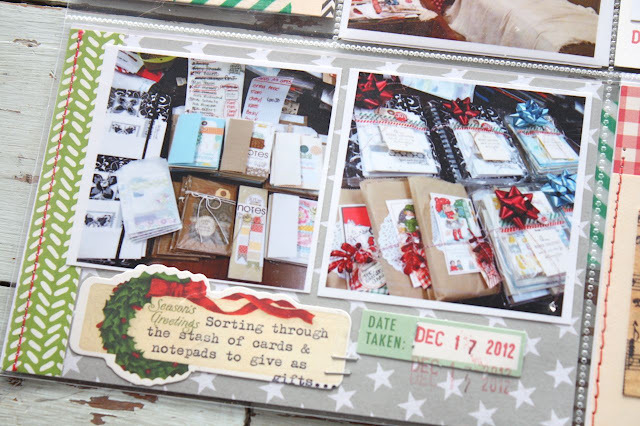 Coming this week and then I'll be moving on to my 2013 Project Life spreads. I'm current, yay! So tell me, did you finish up your holiday pages/DD pages? I don't think I would have completed a separate DD album, it's just too much work. 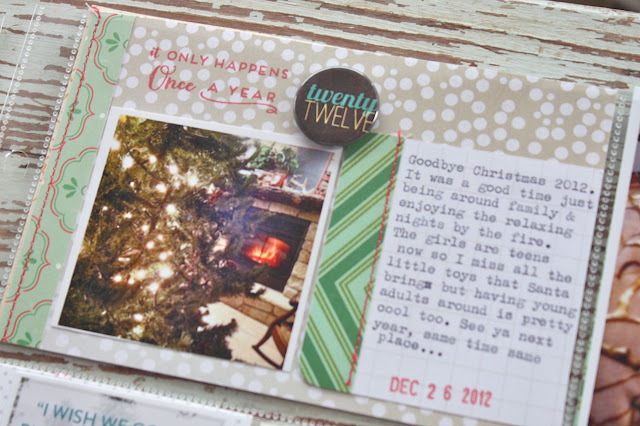 My conclusion from this year is that I think I want to include all holiday happenings in my regular Project Life album. 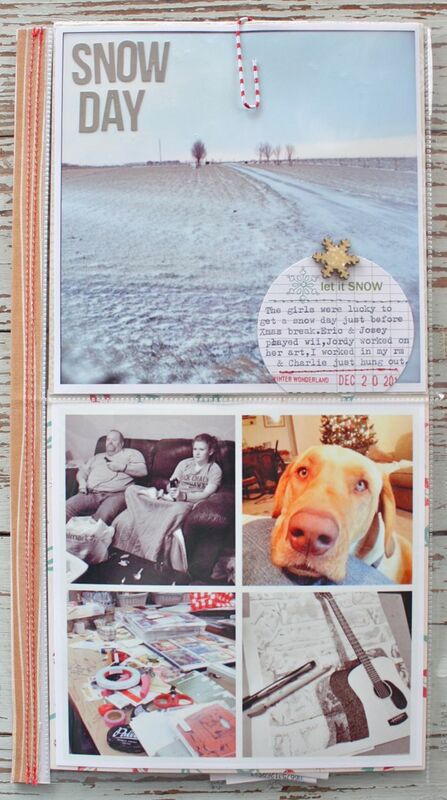 Inserts will be just like a regular insert that I add using divided page protectors. 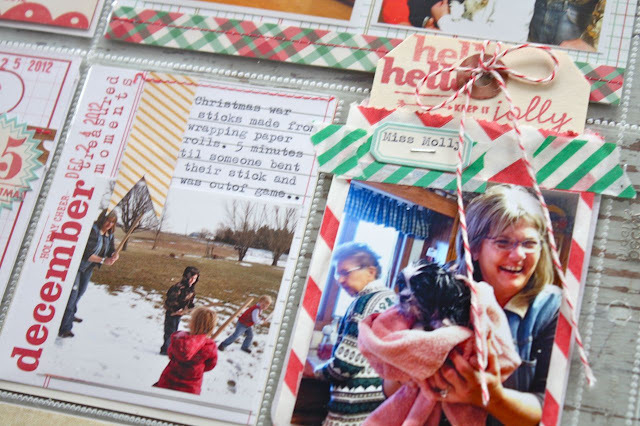 Some of the bulkier pages may not be added. We'll see what 12 months brings us! Happy weekend everyone! 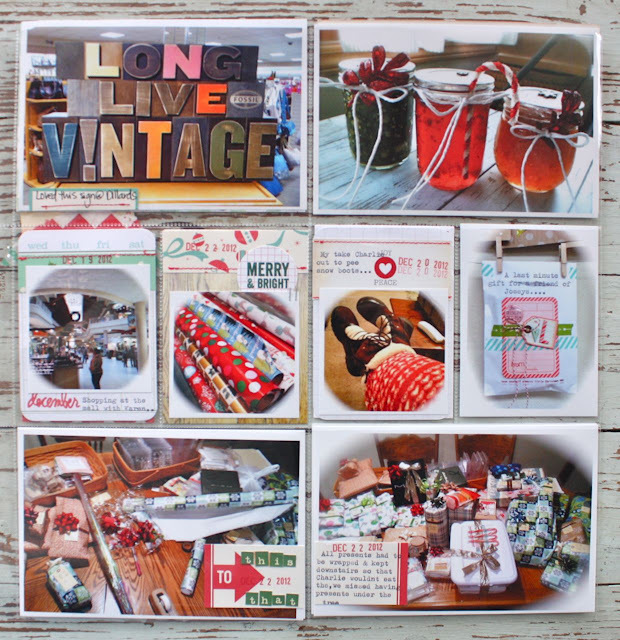 I've got Week 47 of my 2012 Project Life to share today. I'll be wrapping up the 2012 PL weeks soon and then I'll be posting more cards & such starting in February. Coming soon are the rest of my holiday Project Life pages from 2012, some photos of my supply organization and some new blog features that I think you'll really enjoy. I'll kick it all off in February so stay tuned. On to this week of Project Life. It was Thanksgiving week so I knew I wanted to use some warm & toasty colors and patterns this week. I dug these papers from my stash. 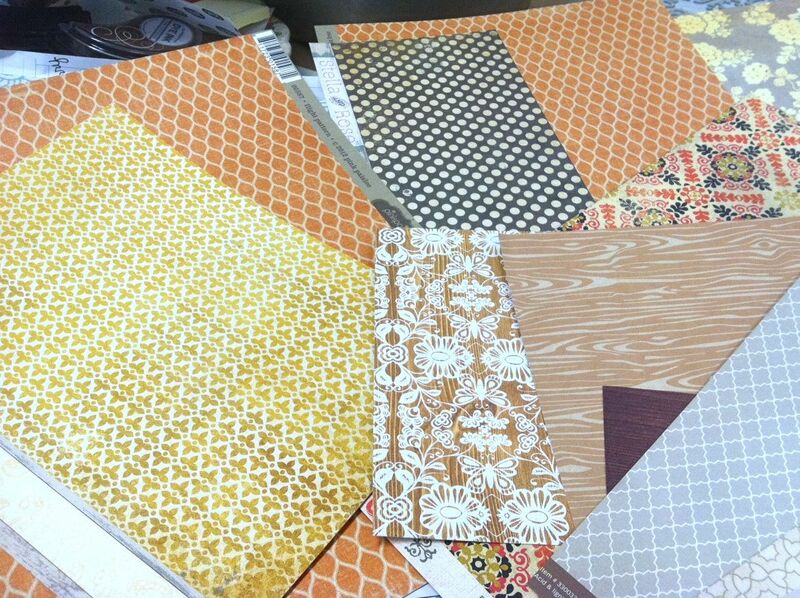 I end up using the orange pattern the most. 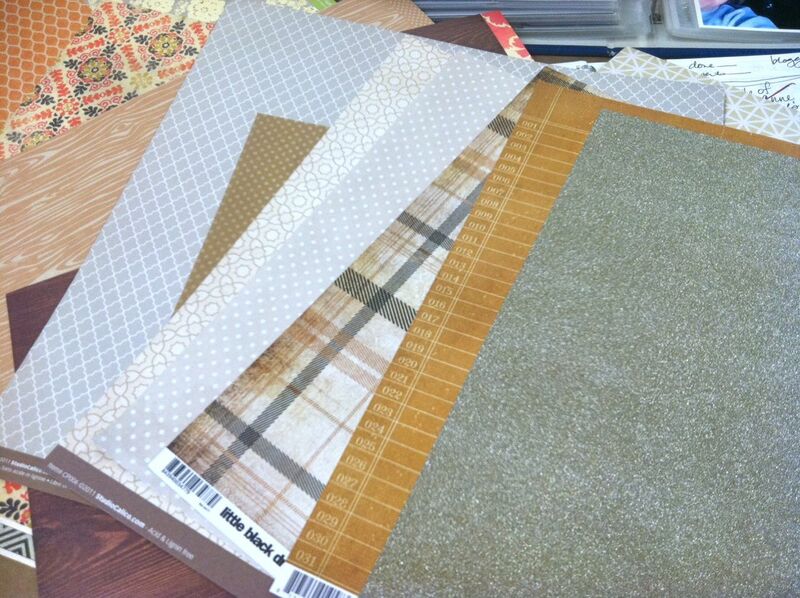 I also had these neutral papers which I used quite a few of, including that gold shimmery paper. This is my 2 page spread. 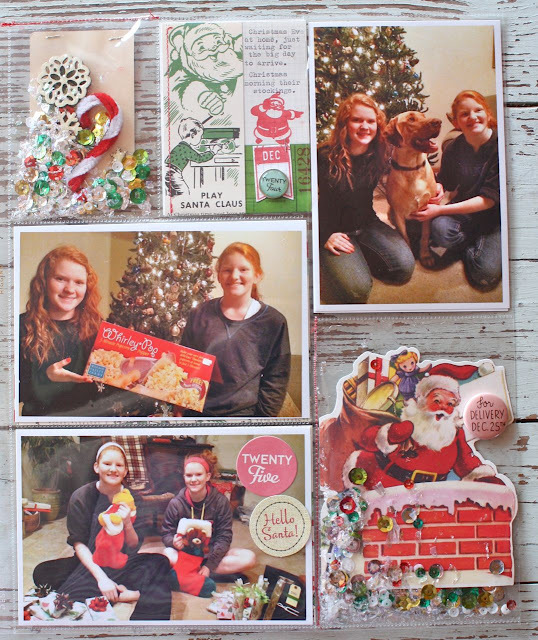 About 16 photos, not too shabby for a 2 page spread. I kept the background papers very neutral using lots of greys. I repeated the same colors and patterns throughout my 2 pages, treating this spread more like a 2 page traditional scrapbook layout. I think the neutral papers kept the layout from getting too busy. And just sayin' but that pineapple crockpot ham from The Crockin' Girls was to die for! You must try it, the recipe can be found on their website. 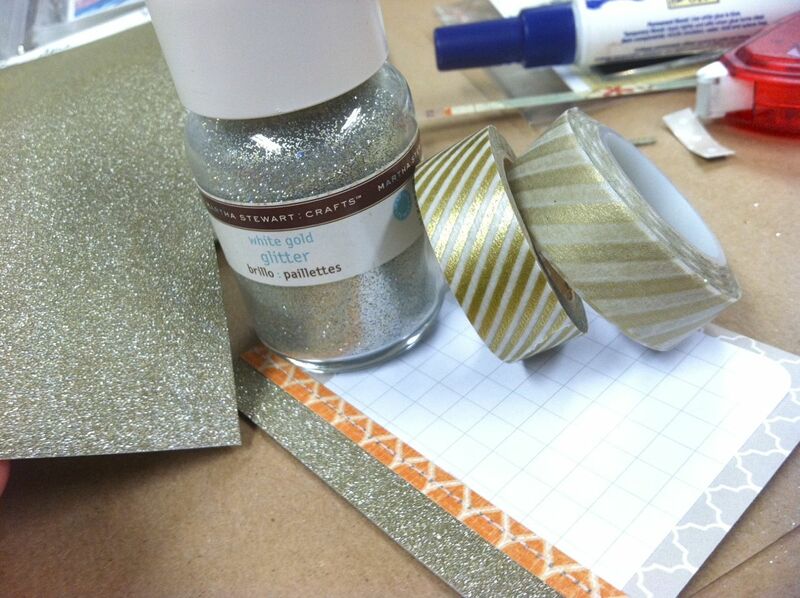 I loved this gold shimmery paper and wanted to use it in small amounts on my inserts. I found a Martha Stewart glitter in my stash that matched perfectly so I added some to some chipboard numbers for my weekly date card. 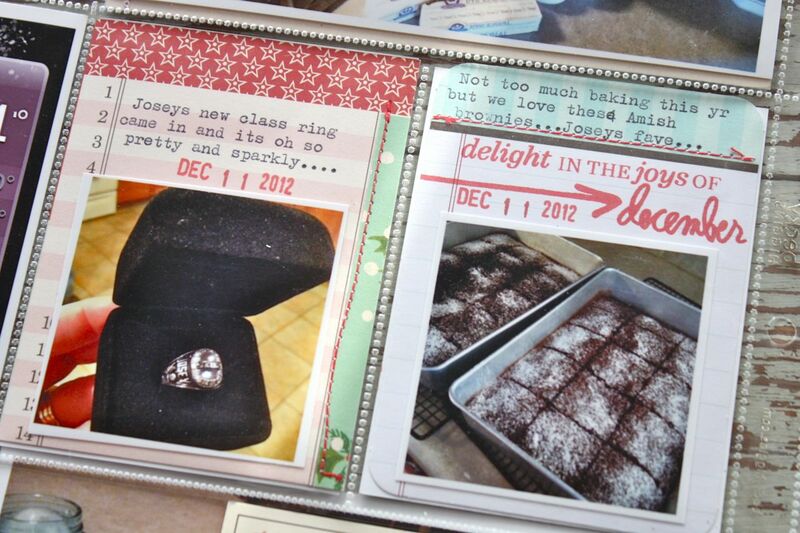 Love how it adds a little sparkle to the insert. 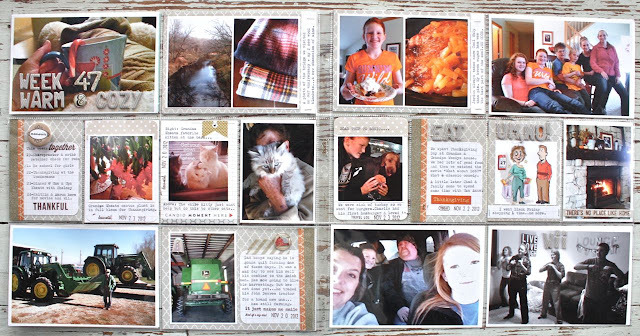 For the rest of my 3 x 4 inserts I decided to create my own using the papers I chose + by trimming down some Becky Higgins Project Life grid journaling cards. I added stitching to tie each insert together. A little gold Washi here and there might not be a bad thing either. 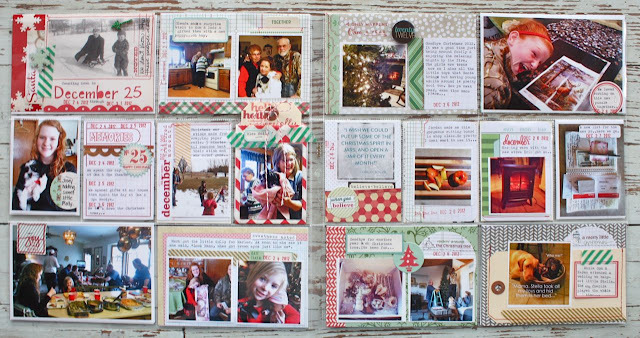 Here I created a 4 x 6 insert using the same method as above. The little brad is from October Afternoon. 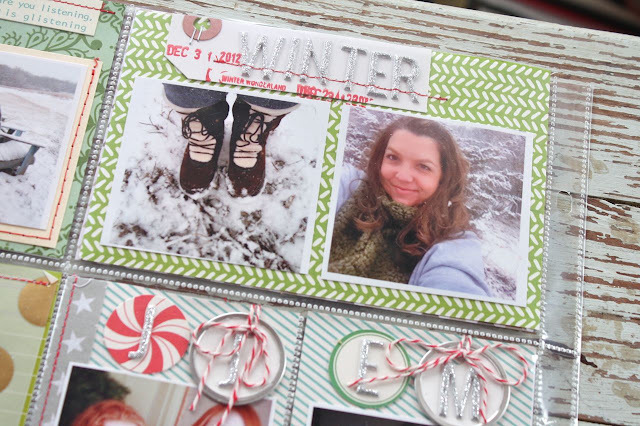 Stamps are from Kelly Purkey. 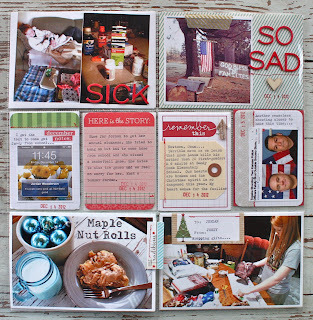 I used the same look for my Week in Review card + more of the Kelly Purkey stamps. I ended up adding this Finding Nana badge later on because I needed some dimension to the the outside pages in my album. This was a good spot. These Evalicious journaling cards were a good fit with this week's layout. I ended up using one in my 2 page spread. Just a sprinkling here and there. Remember just because you like a certain product it doesn't mean you have to use it up in one sitting. Love getting shots of our kitties once in a while. They can disappear so quickly around here that it's nice to snap a photo. My mother was totally smitten with the long haired kitty on the right. And good ol' Charlie. He's just one of the family now. We took him to town on a hamburger run and he snatched one right out of Jordan's hands. Even Charlie loves a good road trip! Throughout my inserts, I repeated the use of these small chipboard letters. Love that look. I saw this funny cartoon on Facebook about Black Friday shopping so I printed it off. 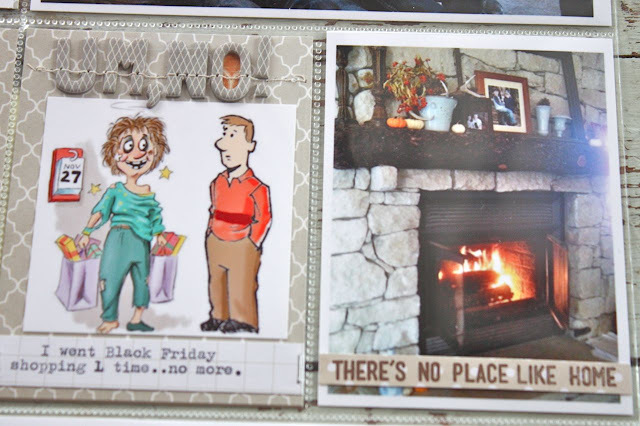 My "no place like home" photo ties right in with my "no shopping" motto. I had one insert for this week. 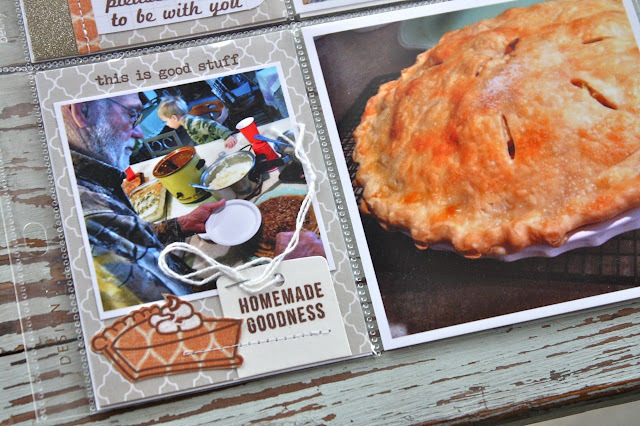 The front side is all about a new pie I made to take to my mom's for Thanksgiving. 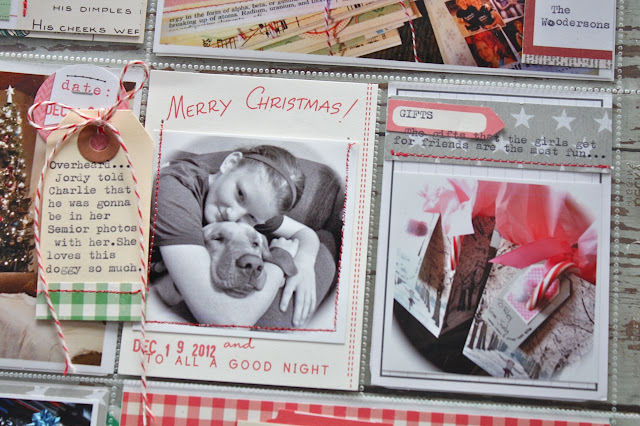 I used the same type of handmade inserts + more of the Kelly Purkey stamps. 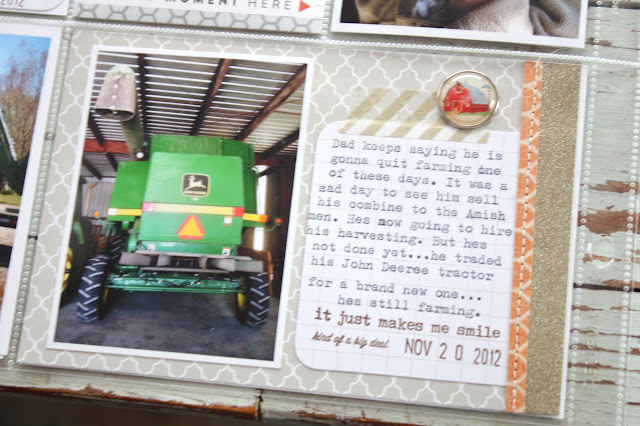 I like to stamp small images on tags like my Small White Tags so the images don't blend in too much with the background. 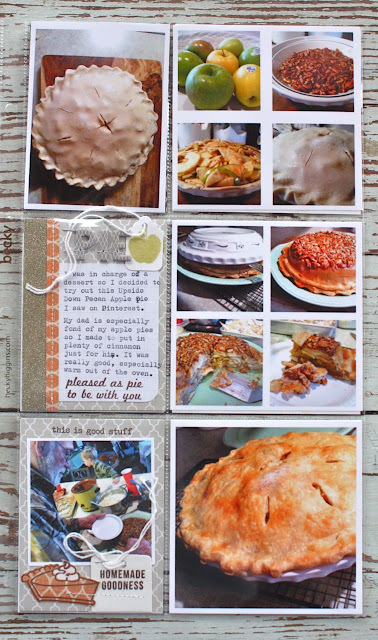 I paper pieced a stamped pie image from Kelly's set + stamped a sentiment on a Rectangle Hang Tag so it would stand out more. 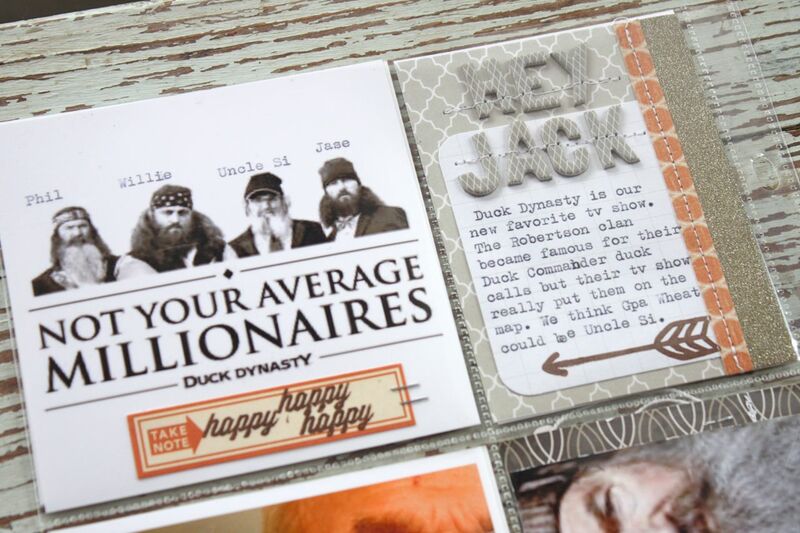 The back side of my insert is all about the Robertson clan from Duck Dynasty. 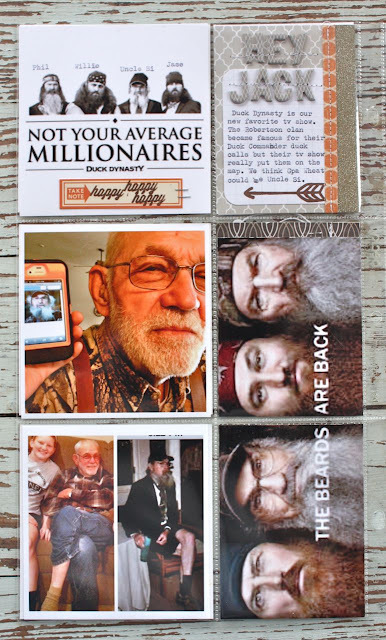 We tease my dad that he could totally be one of the boys if he let his beard grow out. It's fun to capture some of the images from our favorite tv shows. Just imagine if my mom had scrapbooked the Brady Bunch or Gilligan's Island or Happy Days? I found the images of the Robertsons online and just printed them off. I typed the names directly onto the photo with my vintage typewriter. I used the phrases "hey jack" and "happy happy happy" because those are our two favorite sayings from the show. A fun week in the books. Thanks for stopping by and enjoy the weekend everyone. 50 here today, then 70 by Monday....then back to 33 on Wednesdays with wind chills in the teens. That is just nuts!